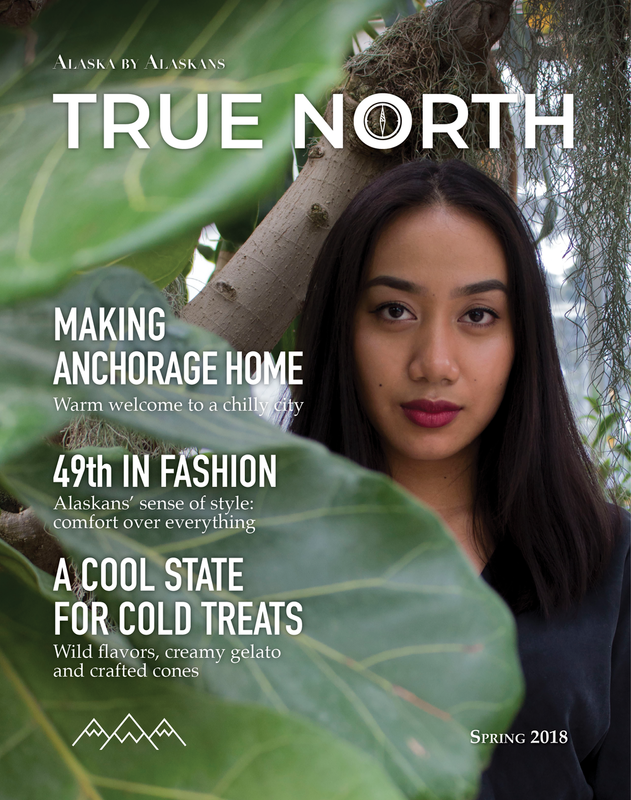 In my final semester at the University of Alaska Anchorage, I had the opportunity to help create the 2018 edition of True North. The team for this year's issue brought a mix of skills and expertise to the table. Several of us wore different hats. I was part of the editorial staff, managed the magazine's website, created logos and worked on design. I saw this magazine as my last chance to contribute something meaningful to the journalism and public communications program. It's hard to put a number on the amount of time we all spent working on True North. What I can tell you is that our longest night involved two large pizzas and a few cups of terrible coffee from a vending machine. We spent most of our time editing stories and finishing layouts. We used a minimal design throughout the magazine with simple type and muted accents. We decided on a minimal concept after we rummaged through Barnes & Noble's magazine section and found magazines with layouts and themes we liked. Some of our team members hadn't designed before True North, so it was fun to share what I've learned about design and to see how each person developed their own styles. We initially had the idea of placing acclaimed artist Jim Gleason on the cover. Gleason fits the image of a typical sourdough Alaskan, down to the full white beard. What we found, though, was that his image was too similar to the most recent 2016 edition of True North. After discussing the cover with other team members and our publisher/professor, Paola, we decided to place a woman on the cover. Altogether, the True North 2018 team was made up of 14 people — nine women and five men. In its 22 year history, women have only been on the cover of True North three times. It was time for something different. Every aspect of this year's cover was created, written and shot by women. I think we all felt a sense of accomplishment once we had the magazine proof in our hands. It wasn't the final version, but after a couple of months of chipping away at our stories, coming up with design concepts and putting in those extra hours, we finally had the magazine in our hands. There are some parts I wish I could go back and change on the layouts I made or helped with. Most of those changes are minuscule details like spacing, logo sizes and alignment. I guess that's typical for any designer or creative in general — our work is never really finished. In the end though, I am happy with what we created as a team. True North Magazine is sponsored by the UAA Journalism & Public Communications. The magazine is distributed throughout the Anchorage community and the state of Alaska. Check out the gallery for a preview of the layouts and a story I co-wrote with Mizelle Mayo.